Image caption Her character will have a special connection with a member of one of Ramsay Street's family - the soap is shown on Channel 5 in the UK. 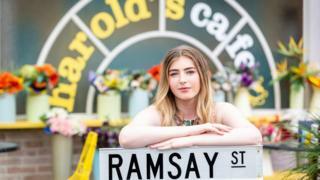 Long-running Australian soap Neighbours has cast its first transgender character, played by 18-year-old actress Georgie Stone. Stone, who is transgender herself, has won awards for her work as an advocate for gender diverse youth. She will begin filming for her guest role this summer, and her scenes will air later this year. Stone approached the show's producers a year ago, to discuss introducing the character. She then auditioned to get the part on the Australian show, which is shown on Channel 5 in the UK. Stone has worked with the writers and producers for the last eight months to integrate parts of her life story into the drama. She said: "I am so excited to be joining such an iconic show. Neighbours is all about telling stories we can connect to, stories that reflect our society today. "It has progressed so much since it first began, which is why I thought it was time to have a trans character on the show. I can't wait for everyone to meet her!" Executive Producer, Jason Herbison said Stone "put forward a thought-provoking and important storyline idea". He continued: "Seeing her talent during the audition process, I knew she would be able to tell the story truthfully and authentically, she is an exceptional young woman." Neighbours isn't the first Australian soap to feature a transgender character. In 1973, the cabaret performer Carlotta joined the soap Number 96 for a short stint as transgender showgirl Robyn Ross. In the UK, both Channel 4's Hollyoaks and ITV's Emmerdale currently feature transgender characters played by transgender actors. Annie Wallace joined Hollyoaks in the role of Sally St Claire in 2015 and last year Ash Palmisciano joined Emmerdale as Matty. EastEnders made British soap history in 2015, when it cast a transgender actor as a recurring trans character. Riley Carter Millington played Kyle Slater on the BBC One soap for a year. ITV's Coronation Street introduced the first transgender character in a UK soap back in 1998 but the part of Hayley Cropper was not played by a transgender actor.